The lifestyle of football players these days in nothing less than that of movie stars. From driving expensive super cars to dating hot models and actresses, footballers with big bank balance love to spend their mullah in style. 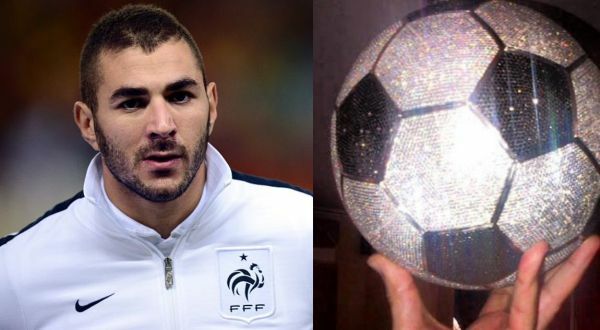 The very latest example of this is the 27-year-old French international and Real Madrid striker Karim Benzema who have splashed a whopping $250k on a diamond-encrusted football. The Real Madrid striker teamed up with celebrity jewelers Dave Bling and Will Da Boss of DWS Jewelry and Co. for this 1,250 carat masterpiece. According to TMZ, the soccer star commissioned the jewelers to create a show piece for his home which led to the creation of this $250,000 diamond-encrusted football. This one of a kind life-sized football features 72,000 colored diamonds. The striker who seems frustrated at Real Madrid due to low number of starts is heavily linked to Arsenal for a summer move. Well, his future will be decided soon as only two weeks are left for the transfer window to close.